A new kind of trade unionism is emerging and consolidating itself within the right2water campaign, led by Mandate and Unite and supported by OPATSI, the CPSU, and the CWU. These unions are bringing the broader social and economic interests of their members to the fore and committing resources, time and effort to support mobilisation not only of members, but also the working class and communities more generally. By viewing their members as workers (as opposed to people paying a subscription for work-place representation services) these unions are placing the workers’ immediate social demands alongside, and equal to, their immediate work-place concerns. This is crucial if the trade union movement is to really represent its members and to recover its power and leverage in society. Wage increases alone will not improve the lot of workers while the political economy of the country is being restructured from one made up of citizens to one of customers in a toll-booth economic and political structure. 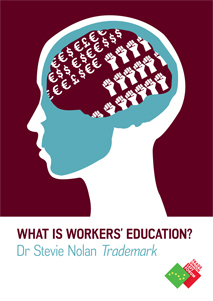 The TULF on many occasions has suggested that the trade union movement has a unique position in Ireland in having the resources and channels of communication to support the mobilisation of working people in a way that no left party can. And now it seems that some unions are realising this potential, which is both necessary and welcome. As well as the five unions mentioned, community groups and parties have signed up to the campaign. Some 40,000 people have signed a petition calling for the scrapping of the water charges, close to 100,000 marched at the demonstration on 11 October, and more local actions are planned for 1 November. The right2water campaign is not dictating tactics to communities or individuals but is building and growing a broad campaign of groups and people based on the principle of water as a human right and as a publicly owned utility and resource. Some on the left have attacked the campaign for not demanding non-payment; but at this moment building the biggest, broadest alliance against water charges and privatisation is the priority. A turn towards direct non-payment may be necessary in the future, but right now the campaign’s strength is in growing and building the alliance rather than splintering over tactical matters. The fact that trade unions, rather than left parties, are now playing the central role makes this campaign different and arguably is what has made it so hugely successful, as demonstrated by the march on Saturday the 11th. With working-class communities showing militant resistance on the ground, often being physically bullied and assaulted by a police force violently supporting the right of capital, this campaign has an opportunity like none before it to be a tipping-point in the resistance against austerity and the diktats of capital. While tactics will need to advance and develop as the campaign grows, so too will the politicisation process be required to intensify. Opposing water charges—a noble effort—is one thing, but the real struggle needed and the one that has transformative potential is the struggle to hold a vital natural resource in public ownership and under democratic control, even in the limited form of democracy that is now allowed, against the desires of the EU, the United States, and the Irish corporate elite. If this is to be a tipping-point, the real enemy needs to be identified; and this is not the corruptly appointed Irish Water and its hacks but the Irish and EU political and corporate elite and their political-economic system. There is much to be hopeful and optimistic about for the first time in a long while, and those unions leading the charge should be applauded and supported.